"This Chinese dish has taken a new dimension - it's made with coconut milk! 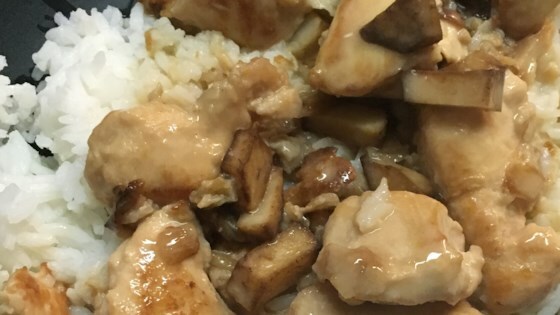 Chicken is simmered with taro, shallots, ginger, and coconut milk. It's delicious with steamed rice." Mix cornstarch and water together in a large bowl until dissolved. Add soy sauce, 1 1/2 teaspoon sugar, and salt. Mix in chicken; cover with plastic wrap and let marinate in the refrigerator, about 15 minutes. Heat oil in a large saucepan or deep-fat fryer. Fry taro until golden brown, 3 to 5 minutes. Drain on paper towels. Heat remaining 1 tablespoon oil in a large skillet over high heat. Add shallots and ginger; cook and stir until fragrant, 2 to 3 minutes. Add chicken; cook and stir until no longer pink, 3 to 4 minutes. Transfer chicken mixture to a large saucepan. Add fried taro. Pour in enough water to cover 3/4 of the mixture. Bring to a boil; reduce heat to medium, cover, and simmer until an instant-read thermometer inserted into the chicken reads at least 165 degrees F (74 degrees C), about 15 minutes. Stir in coconut milk and basil. Season with salt and sugar. Taro is also known as dasheen; you can find it in Caribbean and Asian specialty stores. Substitute 1 tablespoon dark soy sauce for the light soy sauce if desired.